Posted January 23rd, 2019 at 2:36 PM (CST) by Jim Sinclair & filed under General Editorial. 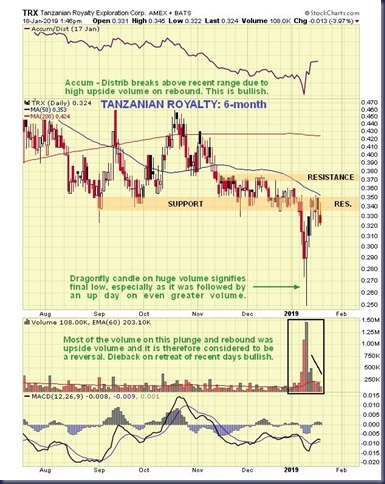 Tanzanian Royalty stock is right now regarded as selling at an extraordinarily low bargain price. There are several important reasons for this. One is that several years back it (and other key mining stocks) suffered from an orchestrated shorting campaign where, after the conspirators heavily shorted a stock, they set about spreading negative disinformation about the company.In the case of Tanzanian Royalty the story was that the company had a piece of land in a banana republic where they were proposing to make a large worthless hole (open pit). The effectiveness of these stories relied on the fact that most investors are too idle or disinterested to do their own due diligence, which is partly understandable given the deep malaise that has afflicted the sector in recent years. Another big reason for the low price is that the stock has been driven down by persistent light “attrition” selling against the background of a lack of interest in the sector, because most investors were chasing a rising broad market and in particular a bubble in the Tech sector and especially in the FAANG stocks, but with all that about to come to an end, interest should return. Still another reason is that most investors have a very sketchy understanding of Africa, and it’s easy to play on their image of the continent as being of mired in rank corruption with guys hacking at people indiscriminately with machetes and driving round on jeeps with machine guns, and of course South Africa and Zimbabwe don’t help the image of the continent. But Africa is a vast and diverse place and Tanzanian Royalty both has the goods in terms of a large proven resource and has a good relationship with the government, which stands to benefit if the company does well and therefore has an interest in its success. Investors skepticism about investing in Africa is therefore considered to be misplaced, and one thing that will certainly help to allay their fears will be rising stock prices in mining companies like this. We have a gold mining company here that has a proven big commercially viable resource whose stock is grossly undervalued – so what are the catalysts that will get it moving? The 1st is a new bullmarket in the Precious Metals sector which will be promoted by a shift out of risk assets and / or a rise in inflationary expectations, and the 2nd big catalyst will be that the new bullmarket will be greatly assisted by a growing wave of M&A (merger and acquisition) activity across the sector, since the easiest way to build up your resources at a time when mining stocks are terribly undervalued is to buy them up. We saw a fine example of that on a massive scale just a few days back with the merger of GoldCorp and Newmont Mining where the action in these stocks tells us that Newmont shareholders got the short end of the stick. 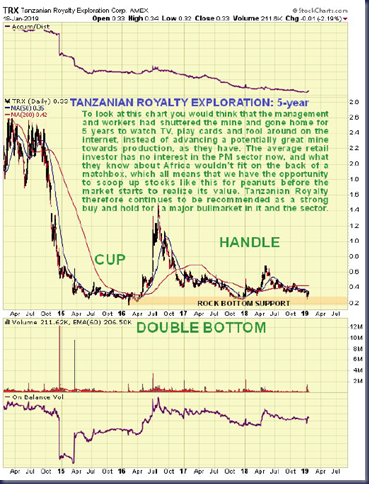 But there is another major catalyst that is thought likely to get Tanzanian Royalty stock moving in short order, and that is the extensive drilling program that is just about to start. The purpose of this drilling program is to further define the resources contained within the planned open pit, but more than that to deep drill into what is suspected to be a potentially world class resource residing beneath the open pit. Even regardless of actual results, this drilling program is expected to generate considerable interest in the company and the stock. The announcement of this drilling program 10 days ago is what caused the stock to bounce back on very heavy volume, which drove the accumulation line sharply higher, a very bullish development, as we can see on the latest 6-month chart below. So that rally out of the lows has a good chance of being the 1st impulse wave of a new bullmarket, which means that the modest reaction back of recent days on declining volume, which is also bullish, is giving us the chance to buy the stock at a very favorable price. 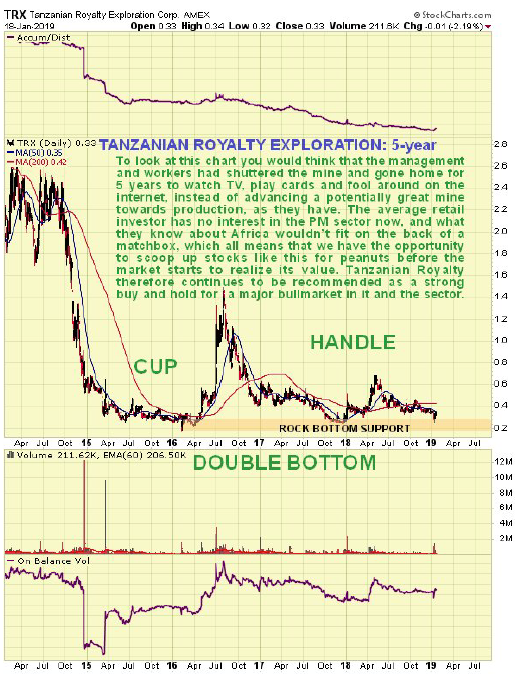 Finally, it is worth reminding ourselves of just how cheap Tanzanian Royalty is historically which we can easily do by referring to the 5-year chart, on which we see that as recently as 2014 it was at times trading at 8 times the current price, and back in 2006 it got to about 27 times the current price, which has its comical aspect when you consider that the company is much closer to attaining its goals than it was back then. This should tell you all you need to know about the intelligence of the average investor. We go on common sense, and stick with the time honored old adage “Buy low, sell high”. 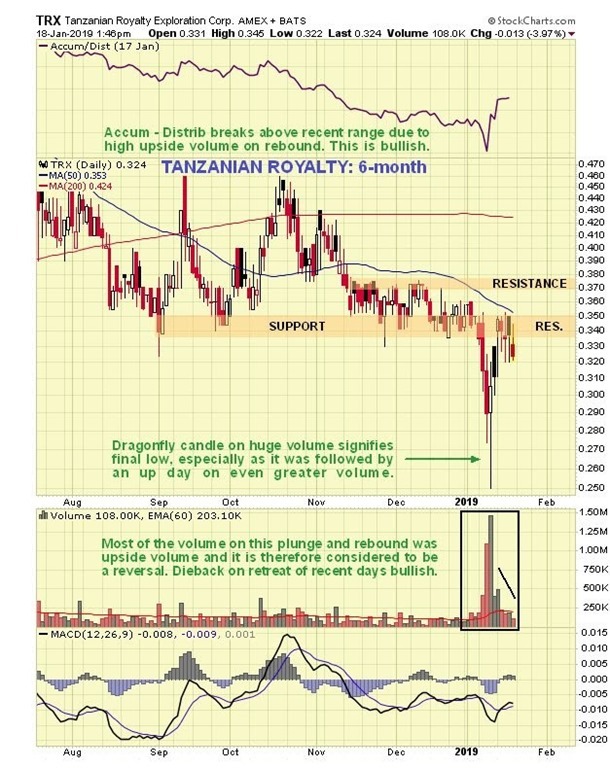 Right now it’s time to buy Tanzanian Royalty low.